The US Federal Aviation Administration said it is set to issue new guidelines to inspect jet engines like the one that ruptured during a recent Southwest Airlines flight. Within the next two weeks rules requiring "an ultrasonic inspection of fan blades" of certain jet engines "when they reach a certain number of takeoffs and landings" will be issued, the FAA said in a late Wednesday statement. Blades that fail the inspection will have to be replaced, the FAA said. The directive comes after the left engine of Southwest Airlines Flight 1380 suddenly blew apart during a Tuesday flight from New York to Dallas. The shrapnel shattered a window and depressurized the cabin, partially sucking a woman out of the plane. Fellow passengers pulled the woman—identified as Jennifer Riordan, 43—back in, but she later died of her injuries. 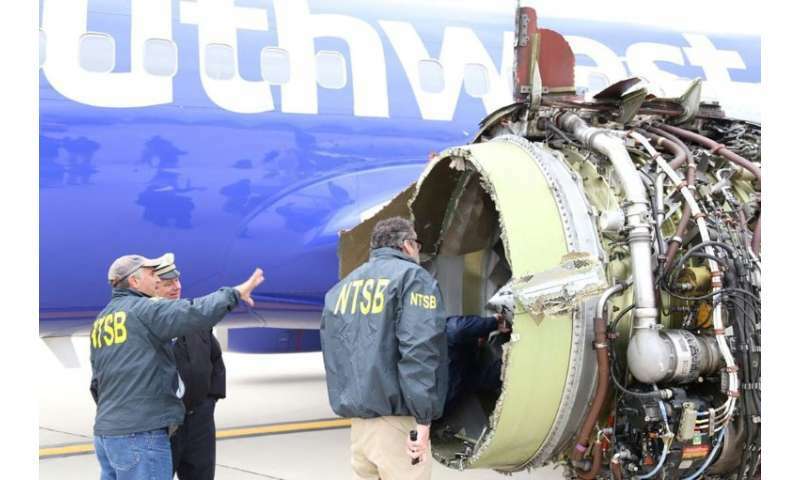 Robert Sumwalt, head of the National Transportation Safety Board (NTSB), said that a first inspection of the Boeing 737's damaged engine showed that an engine fan blade was missing, apparently broken due to metal fatigue. The incident damaged the engine external covering, known as cowling, where several blade fragments were discovered once the plane landed, Sumwalt said Wednesday. "I'm very concerned about this particular event," Sumwalt said. The CFM56-7B jet engine in question, made by CFM International—a joint venture of General Electric and France's Safran—is widely used around the world on Boeing 737s and has a solid record of safety. "If we feel there is a deeper issue, we have the capability to issue urgent safety recommendations," Sumwalt added. Southwest earlier announced extra inspections of the CFM-56 engines in their fleet, which should be completed within 30 days. A similar accident on a Southwest Airlines flight in August 2016 forced the aircraft, also a 737 equipped with the CFM-56 engine, to make an emergency landing in Florida. There were no casualties in that accident. CFM International has called on airlines to carry out additional engine inspections, according to US media reports. The captain of SW Flight 1380, Tammie Jo Shults—one of the first women fighter pilots in the US Navy—was widely praised as an American hero for calmly landing her stricken jet after the midair engine explosion. Shults and her co-pilot, Darren Ellisor, said in a statement late Wednesday that they are focusing on work and not conducting media interviews. "We all feel we were simply doing our jobs," they said, referring to the accident. "On behalf of the entire crew, we appreciate the outpouring of support from the public and our coworkers as we all reflect on one family's profound loss."